Brushing your teeth with braces on is tricky. Braces lodge food, harbors dental plaque and make your teeth more prone to tooth decay. 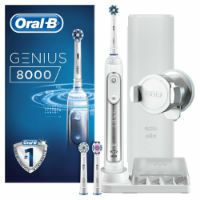 Your oral hygiene really needs to be on its A-Game! 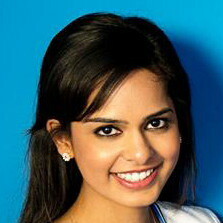 As a dentist who places and has worn braces twice, I know your pain both professionally and personally. In this comprehensive article, I will be going over all the tips and tricks to make your life as easy as possible. Plus, I will be covering a detailed step by step guide on how to brush your teeth with braces with both a manual and electric toothbrush. As a general rule for people wearing braces, I recommend using an electric toothbrush. This is because it is simpler, easier and cleans your teeth better. That being said it is possible to brush your braces with a manual toothbrush, it is just difficult to do. Please use the quick navigation below to jump to the section you are most interested in. 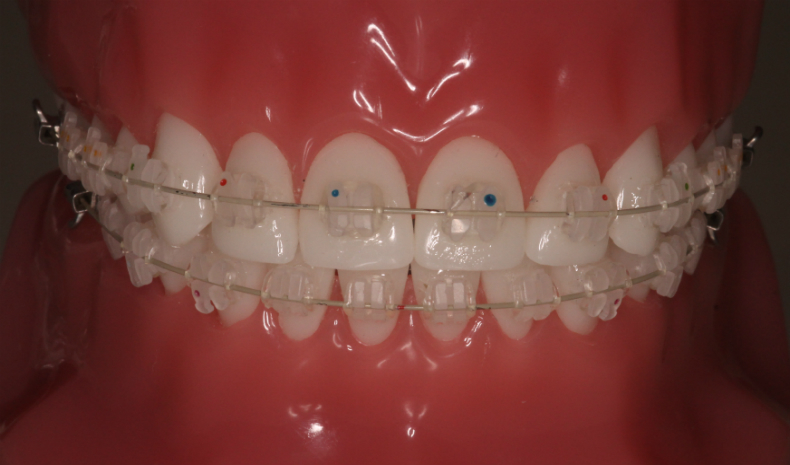 Braces contain many nooks and crannies for food and bacteria to become lodged. Once lodged, these germs start to attack your teeth and gums with acid and other nasty chemicals. If these germs are left to stew for a prolonged period of time, it can lead to gum disease, tooth decay and tooth decalcification. Gum disease is where the gums become inflamed because of the bacteria releasing chemicals. In early gum disease, this presents as redness, swelling and bleeding on brushing. If left, gum disease can progress to gum recession, wobbly teeth and even tooth loss. Not good for your brand new smile! Tooth decay and decalcification can occur when sugary food gets trapped between your braces and your teeth. Removal of the sugary food with proper brushing and use of fluoride toothpaste will help prevent tooth decay. The American Dental Association (ADA) recommend that you brush your teeth after every meal and I completely agree. This means that you will be brushing your teeth minimum three times a day for breakfast, lunch and dinner. The reason for this is because food always gets lodged between your braces and your teeth. If you work a regular nine to five job, you will need to bring a toothbrush into work with you. Trust me you will want to because food stuck in braces is not a good look! In the latest Cochrane study, electric toothbrushes removed 21% extra dental plaque when assessed after a 3 month period compared to a manual toothbrush. This is not as grandiose as what some of the electric toothbrush manufacturers claim but still, 21% is a significant amount. As you have braces on your teeth, any improvement of plaque removal will be beneficial. Plus using an electric toothbrush is much simpler to use, as you just hold it on your teeth and do not need to make a complex movement. 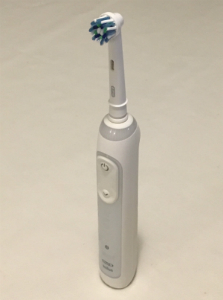 Good electric toothbrushes make sure you brush for the correct amount of time and with the right amount of pressure. Investment in an electric toothbrush is worthwhile for anyone with braces. A small headed toothbrush is much more maneuverable than large headed ones. This means that they can get between all the nooks and crannies created by the brace. Whenever I get a patient to bring in their manual or electric toothbrush, they always have a brush which is far too big. The ideal size to aim for is around 1.5cm to 2 cm. This would be big enough to make the brush useful and small enough to allow it to access the back molars. The average person brushes their teeth for only 45 seconds. This is far too short! You should aim to brush your teeth for at least 2 minutes. This is especially important with braces because teeth with braces tend to harbor more dental plaque. 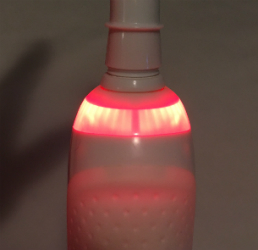 If you are struggling to brush for two minutes, then I would recommend using a 2-minute timer like the app Brush DJ or alternatively getting an electric toothbrush with a built-in 2-minute timer. It is not only brushing for the 2 minutes that is important but also to brush your teeth evenly. Don’t brush one tooth for 2 minutes and expect to have great teeth! Make sure to change area frequently and brush each surface of each tooth consistently. 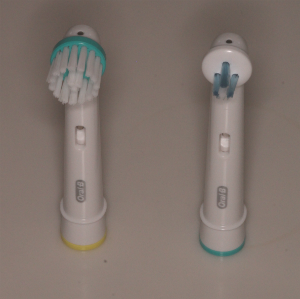 An interspace brush is effectively a really tiny headed toothbrush. It is really useful for cleaning underneath your orthodontic wire and close to the gum line. Click here to find the interspace brush I recommend. 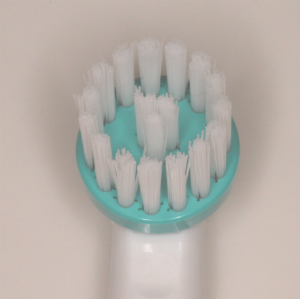 Use the interspace brush before brushing your teeth for two minutes to finetune your cleaning. Thoroughly recommended to all people wearing braces. Food and bacteria can quite easily lodge between your wire and in between your teeth. Use interdental brushes to clean these areas at least once a day. 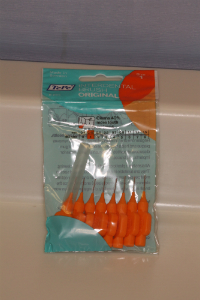 Click here to find the interdental brushes I recommend. 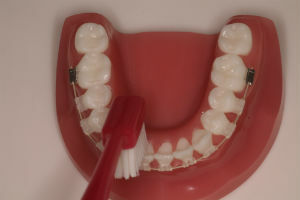 Some people ask whether they should use interdental brushes before or after brushing. I would recommend using the interdental brushes before you brush your teeth as it allows the fluoride toothpaste to access between your teeth. I think the difference between using interdental brushes before or after brushing your teeth is minuscule. concentrate on using them at least once a day. Fluoride toothpaste helps prevent tooth decay. People who wear braces are more susceptible to tooth decay, therefore it makes sense to use fluoride. Fluoride works by hardening the enamel of the tooth and inhibiting the decay-causing bacteria. 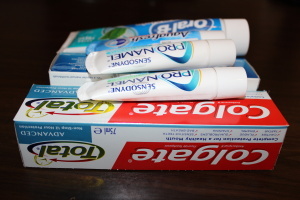 Most mainstream kinds of toothpaste contain fluorides like Colgate total and Oral-B Pro-Expert. If you want even more cavity protection, look for kinds of toothpaste that contain both xylitol and fluoride like Quip Toothpaste or Plaque HD. The difficulty with dental plaque is that it is tooth coloured, so it is really difficult to know whether you have removed all the plaque from your teeth. Enter the plaque disclosing tablets. The plaque disclosing tablet dyes the dental plaque a different colour (normally pink or purple). This is really useful for braces. Ideally, use the plaque disclosing tablets before you start brushing your teeth and then brush off all the colour from your teeth. It is as simple as that. The only problem with plaque disclosing tablets is that they dye your tongue and sink a different colour. If you want to get around that, then there is a new innovative toothpaste called Plaque HD. This toothpaste uses targetol to dye the dental plaque green. I would recommend checking it out. I covered the modified bass technique in detail in the past. 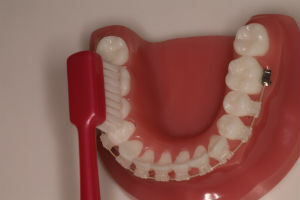 The modified bass technique is where you hold the manual toothbrush at a 45-degree angle to the teeth and concentrate on brushing the gum line. Make small circular motions with around 150 grams of force spending around three seconds per tooth. If you use a good electric toothbrush to brush your teeth with braces, then all you will need to do is hold the electric toothbrush at a 45 degree angle and let the toothbrush do the work for you. Much simpler! Most people press far too hard when they brush their teeth. This can lead to unnecessary gum recession and toothbrush abrasion. The correct amount of pressure to apply is 150 grams of pressure which equates to the weight of an orange. The best way to make sure you brush your teeth with the correct force is to use a visible pressure sensor on an electric toothbrush. This will then flash whenever you press too hard. You will be surprised by how often you press too firmly. I certainly was! 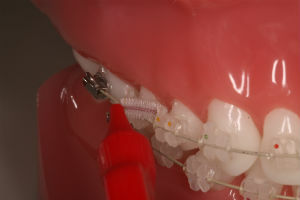 Firstly, use an interspace brush to remove any food debris from underneath the orthodontic wire and around the brackets. 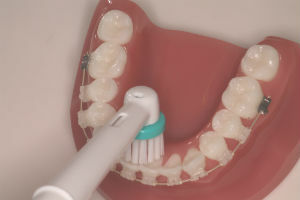 Use an interdental brush and floss to clean between your teeth. This is to remove any dental plaque interdentally. I bend the interdental brush slightly to make it easier to use. Wet the toothbrush head slightly. This is to clean the bristles before you use it. Place a pea-sized amount (0.25g) of fluoridated toothpaste on your electric toothbrush head. Do not place a stripe of toothpaste. This is far too much and will lead to you depleting your toothpaste quicker. Put the electric toothbrush head in your mouth and then turn it on. This will prevent the toothpaste from splattering everywhere. Start on the outside surface of your teeth and angle your toothbrush at a 45-degree angle. This 45-degree angle allows the bristle to clean underneath the gum and adequately clean the orthodontic brackets and wire. Aim to spend in total around 3 seconds per tooth. Once the outside surfaces of your teeth are cleaned, move onto the chewing surfaces and then the inner surfaces of your teeth. After 2 minutes of brushing, spit out the excess toothpaste. 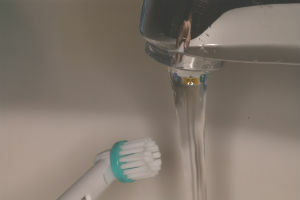 Do not rinse your mouth out with water as this will remove the fluoride from your teeth. Remember spit do not rinse. 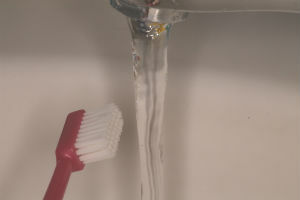 Remove any of the excess toothpaste from your brush head by rinsing underneath the tap. Your braces should now be sparkling clean! Remember to repeat the process every day after breakfast, lunch and dinner. As with the electric toothbrush, use an interspace brush to remove any food debris from underneath the orthodontic wire and close to the gum line. 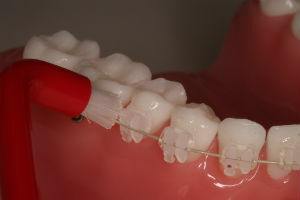 Then use an interdental brush to clean interdentally. Do this before brushing your teeth as it will allow the fluoride to access between the teeth. Wet the manual toothbrush bristles. This is to clean the bristles before use. 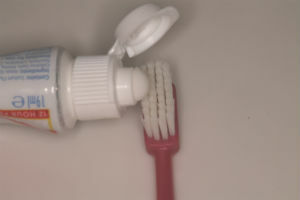 Place a pea-sized (0.25g) of toothpaste on the bristles. 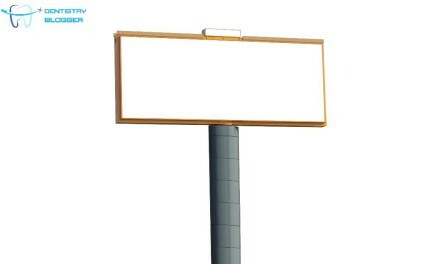 Many toothpaste adverts show a stripe of toothpaste, this is far too much toothpaste and is a waste. 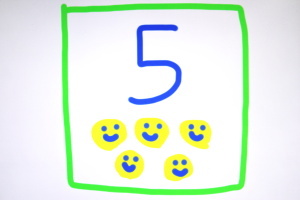 Set a 2-minute timer and start on the outside of your teeth (where your braces are). 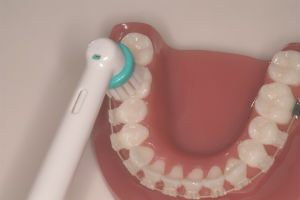 Place the manual toothbrush at a 45-degree angle, as demonstrated in the picture. Make sure to brush a mixture of the gum and the tooth. 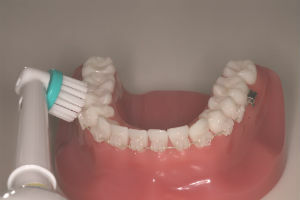 The 45-degree angle will let the bristles clean underneath the gum line. 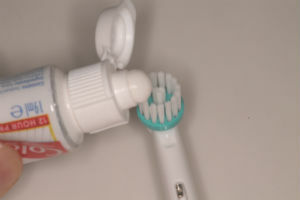 The trick is to make small circular motions with your manual toothbrush with around 150 grams of pressure. Aim to spend in total 3 seconds per tooth. Once the outside surfaces of your teeth have been adequately cleaned, then move onto the chewing surface and the inner surfaces. Note when cleaning the inner surfaces of your front teeth, you will need to angle the brush upwards. 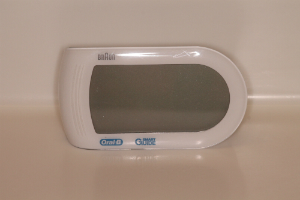 After the 2 minute timer has beeped, spit out any excess toothpaste. It is important at the stage to not rinse your mouth out with water. This is because you want the fluoride from your toothpaste to remain on your teeth. Remember spit do not rinse. 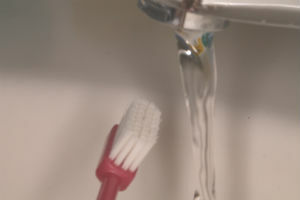 Remove any excess toothpaste from your toothbrush by gently rinsing it underneath the tap. Do not rub your finger too firmly on the bristles as this will fray them. Your teeth and braces should be nice and clean. You will need to repeat the process every day after breakfast, lunch and dinner. How often do I need to brush my teeth with braces? The American Dental Association (ADA) recommends brushing your teeth after every meal. This will be usually three times a day after breakfast, lunch and dinner. I would recommend against “grazing” on food when you are wearing braces. Try to stick to eating three times a day, as this will limit the number of sugar attacks your teeth will have to defend themselves against. What foods should I avoid with braces to make brushing easier? What foods should I eat with braces to make brushing easier? How often should I replace my brush head when brushing braces? The ideal time to replace an electric toothbrush head or manual toothbrush is when the bristles start to fray or after 3 months, whichever is earlier. 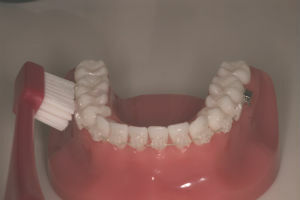 You will find that because of the braces, the bristles start to fray earlier so they may only last for 2 months. 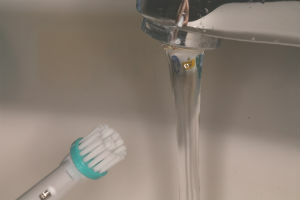 It is always better to replace manual toothbrushes and electric toothbrush heads more frequently, rather than wait until they are very frayed and unusable. Should I use an electric toothbrush or manual toothbrush to brush with braces? I would recommend using an electric toothbrush for simplicity. You can use a manual toothbrush it is harder to use and requires more manual dexterity. If you need help choosing the right electric toothbrush for braces click here. 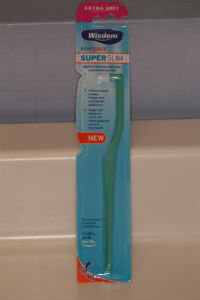 If you are unsure as to whether to opt for Oral B or Sonicare click here. How much pressure should I be applying when brushing with braces? You should be applying 150 grams of pressure when brushing teeth. This is the same as a weight of an orange. If you press too firmly whilst brushing, this will result in gum recession and a type of tooth wear called toothbrush abrasion. 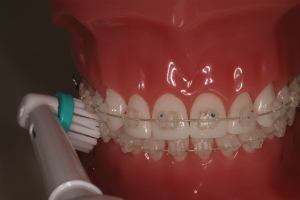 Is there any difference between adults and children brushing with braces? Children usually have braces on their teeth between 12 to 14 years old when the premolars have erupted and exfoliated the deciduous molars. At this age, children have most of their permanent teeth and therefore have a very similar dentition to adults. All the tips and advice from this article would apply to 12 to 14 year old children as well as adults. 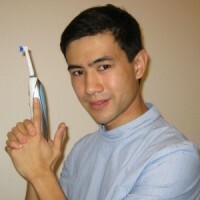 Thank you for reading my article on how to brush your teeth with braces. If you have any questions or feedback then please ask me in the comments section below. I look forward to reading your comments and hope you have a great day. 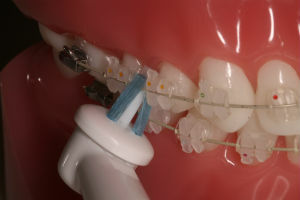 NextFloss vs Interdental brushes. Who Wins?